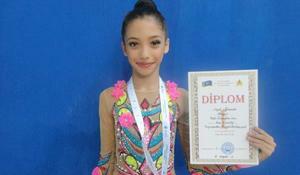 The 25th Azerbaijan and Baku Championships in Rhythmic Gymnastics have been held in the National Gymnastics Arena in Baku. The audience in the National Arena of Gymnastics is very supportive and it helps us to perform, Leyli Aghazadeh, representative of the "Ojag 1" team , who came first in group exercises among gymnasts born in 2006-2007, in the competitions of the 25th Azerbaijan and Baku Championships in Rhythmic Gymnastics. 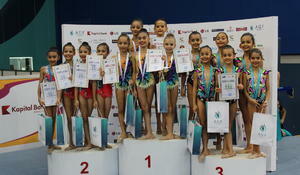 A ceremony to award the winners of final day of the 25th Rhythmic Gymnastics Azerbaijan and Baku Championships among age categories was held in Baku. 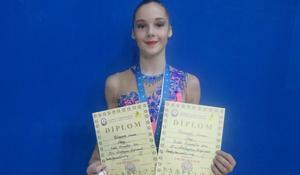 I like to perform in the National Gymnastics Arena - there is good atmosphere and a large hall, "Ojag Sport" club's gymnast Yelizaveta Luzan told Trend.